Mary Kay’s new Liquid Eyeliner Pen is described as an ‘innovative eyeliner which combines the ease of a pencil with the definition of a liquid for precise, no-mess results’. In one liner, it is said to be able to achieve ‘killer cat flicks and razor sharp lines’. I tried this Eye Liner in the one shade it is available in- Black, which is an agreeable lone shade. It comes in the form of a simple, felt tip pen. The soft, felt tip applicator varies in width which makes it easy to achieve fine lines or thicker lines. For fine, precise lines, minimal pressure is required. For thicker lines, a bit more pressure compresses the tip to make the thicker part of the tip meet the skin. The flow of product from the tip is smooth, and comes out evenly from the non-drip precision tip. The eyeliner dries quickly and with a semi-matte finish, which is impressive since most liquid liners have a gloss finish that reduces the dramatic impact. This Liquid Eyeliner Pen is smudgeproof for a good length of time, last durably for several hours before showing any signs of fading. This is probably due to the water resistant formula. Most waterproof formulas flake during wear due to lack of hydration, however this eyeliner is reassuringly flakeproof. The Black shade stays intense during wear and appears almost as a carbon black, making it a suitable eye liner choice if you are looking to achieve ‘killer cat flicks’ and powerful intensity. Overall, this is a high quality liquid liner that provides long wear benefits in terms of intense colour and impact for the eyes. The felt tip applicator can be used in a variety of ways to achieve different widths of lines, making it a versatile eyeliner as well as a good performing one. 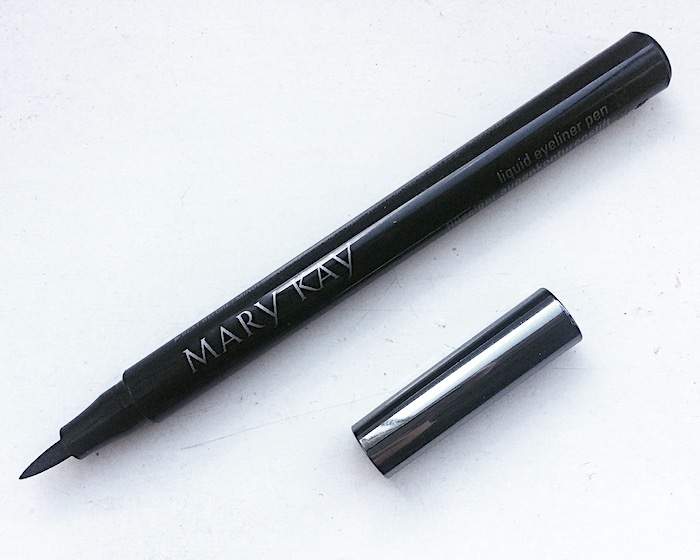 Mary Kay Liquid Eyeliner Pen is priced at £11.00.